This NCLEX review will discuss osteoporosis. As a nursing student, you must be familiar with osteoporosis along with how to care for patients who are experiencing this condition. Don’t forget to take the osteoporosis quiz. What is Osteoporosis? It’s a disease process that thins the bones to a point that the bones are not strong enough to withstand everyday stress and it breaks/fractures. Most common type of fracture seen in patient with osteoporosis is called Colles’ fracture. This is a fracture of the lower part (distal) of the radius at the wrist. What is happening to the bones in osteoporosis? The inside of the bone (specifically the spongy bone) becomes very porous and the bone’s density decreases….making it weak. Inside the spongy bone resides cells called osteoblasts and osteoclasts. Osteoclast CONSUME bone and osteoblasts BUILD bone. Normally, osteoblasts and osteoclasts work at the same rate. However, in osteoporosis the osteoclasts start to outwork the osteoblasts. This disease suddenly sneaks up on a patient (in most cases without signs and symptoms). The patient is usually surprised with a bone fracture. Osteoporosis most commonly affects the wrists, hips, and spine. Spongy Bone: a matrix of pore-like components (hence its name “spongy”), such as proteins and minerals (calcium and phosphate). In osteoporosis this matrix starts to thin (it becomes more porous…making the bone weak). Within the spongy bone are OSTEOCLASTS (they consume the bone matrix and remove substances from the bone (calcium) and puts it in the bloodstream when we need it). OSTEOBLASTS (build up the bone matrix within the spongy bone by taking substances (phosphate and calcium) from the blood and building up the bone. Parathyroid hormone (PTH): When calcium levels are low the parathyroid gland secretes PTH (parathyroid hormone). This causes the osteoclasts to break down the stores of calcium in the bone so it can be placed in the blood….hence increasing calcium levels. In addition, PTH increases the small intestine reabsorption of calcium, and decreases the kidneys from excreting calcium. It is important to note that parathyroid hormone INDIRECTLY stimulates osteoclast activity. It plays a role with osteoblasts as well because PTH actually binds to osteoblasts.. In a sense the osteoblasts will control/regulate the activity of the osteoclasts under the influence of PTH. Therefore, if extra doses of PTH are given (as with the medication treatment drug Teriparatide “Forteo”) this can actually improve bone health by making the bone stronger and more resistant to fractures. Calcitonin: When calcium levels are too high, the thyroid gland creates calcitonin to decrease the activity of the osteoclasts…..less break down of bones, which will keep calcium levels normal. Estrogen: controls the activity of osteoblasts and osteoclasts by keep the bones strong and prevent bone resorption by the osteoclasts. Estrogen in a nutshell prevents the osteoclasts from living too long. Why is this important to know? Remember estrogen is secreted by the ovaries. When a woman enters menopause she will produce less estrogen, which places her at risk for osteoporosis. Testosterone: this is converted into estrogen to keep bones stronger, as stated above. As men age testosterone levels decrease and this puts them at risk for osteoporosis. It is important to note that during a person’s mid 30’s most people reach peak bone mass. The osteoclasts and osteoblasts are working at the same rate. 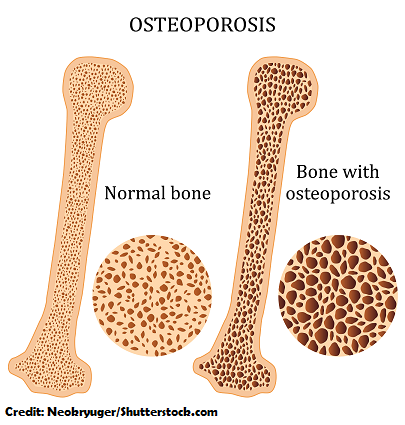 BUT after the mid 30’s the bones are broken down faster than replaced….hence why we see osteoporosis in older age. GI upset and esophagus problems: IMPORTANT!! Take with full glass of water in morning on empty stomach with NO other medications and sit up for 30 minutes or more…(60 minutes with Bonvia) after taking and don’t eat anything for 1 hour..helps the body absorb more of the medicine. Calcitonin: made from salmon calcitonin, decreases osteoclast activity. Remember calcitonin is secreted by the thyroid gland naturally. “Osteoporosis.” National Institute on Aging. N.p., 2017. Web. 5 Sept. 2017. “Osteoporosis Overview.” Niams.nih.gov. N.p., 2015. Web. 4 Sept. 2017.